This is one of the unique features of MagLoft. You can use our visual drag and drop editor to create content that fits perfectly on any screens size and orientation. Our editor is based on the famous Twitter Bootstrap Theme which was made popular by, well Twitter, when they made it freely available to the web. Without going into technical details, it's a template for creating responsive content pages. We have several themes available to use for free inside your MagLoft account. We also continue to add new themes and new features to our editor. We can also help you turn your PDF files into a responsive theme with several page templates that you can re-use and tweak as much as your heart desires. We will analyze and review your PDF file and create a set of pages that mimic the look and feel of your PDF. Only now, it's responsive which means no more pinch to zoom! You also now have more options to add interactivity using the interactive widgets and HTML. I'm a Web Designer Can I Make My Own Theme? Can you give me some examples of interactive content offered by MagLoft? If you can drag and drop, you can publish with MagLoft! We currently support online streaming video from YouTube, Vimeo and Yahoo Screen using the widgets in our editor. We are looking into expanding the video options with addition of embedded videos. It will always be a tradeoff of offline video capabilities versus large bulky download sizes, but we are very optimistic that we can find a way that works. Ultimately it's also up to you if you want to offer a 200MB size issue or an optimized 30MB issue. We generally advise to stay around 50MB maximum in size. Do you support HPUB file uploads? 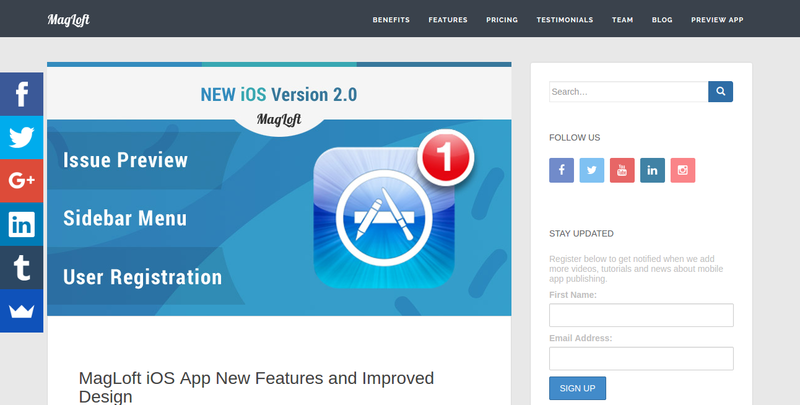 This is another of unique features of MagLoft. An HPUB file is basically a mini website where you create all the HTML, CSS and JS yourself. This gives you endless opportunity for creating exactly what you want. We do suggest that you use a framework like Twitter Bootstrap or similar in order to keep it responsive, and looking great on any screen size and orientation. Do you support WORD documents? No, unfortunately we don't. You can convert the WORD documents to PDF and upload the PDF in our editor. It might be a bit messy but it will work. Alternatively you can upload your images to MagLoft and copy/paste your text/images into one of the cool responsive themes we offer. This will allow you to create content that fit's perfectly on any screen, size and orientation. Do you support EPUB files? Yes, we already have a few clients using EPUB files. It's currently not a native feature of MagLoft, but we will help you convert the files to HPUB and then it works great as well. Do you support right to left arabic text? We do support arabic text and also right to left reading. What is the maximum audio size to upload? As of now, we only support the online audio from Soundcloud. We're working on mp3 playlist as well. If you're using for the cover image, 768 pixels width x 1024 height will suit best. What is the maximum PDF size to upload? We generally reccomend the size of 50 MB but the current limit is 200MB. If I update my PDF, how do I replace the one that is published in the app? The people who have downloaded the issues from your apps will need to archive and delete the issues first. Then they can download the latest one. We are working on a special push notification feature that will force download issues for readers that have subscribed to push notifications. This is great if you notice a typo or want to change something critical in your issue. Is it possible to use animated GIF's with MagLoft? Can I edit the content of my magazine once I publish it? For issues created using our editor, you can just edit and save the pages you need to change and then pack the issue again. If it's a PDF, then you need to re-upload the PDF and this is where any changes made (widgets) will get reset (deleted). So please do take note, that if you upload a PDF, then add some widgets to the PDF and then later upload a new PDF, all the widgets you added will get removed. Readers who have downloaded the issue from your apps will need to archive and delete the issue first and then download the latest one. How do I change the size of the font? In order to change the font, you would select/highlight the text and then click on the Font icon from the black toolbar that appears. You can change the size of the text in a paragraph, by selecting the paragraph widget, and then changing the Size from the right hand Properties section. Is it possible to test the apps before submitting to app stores? 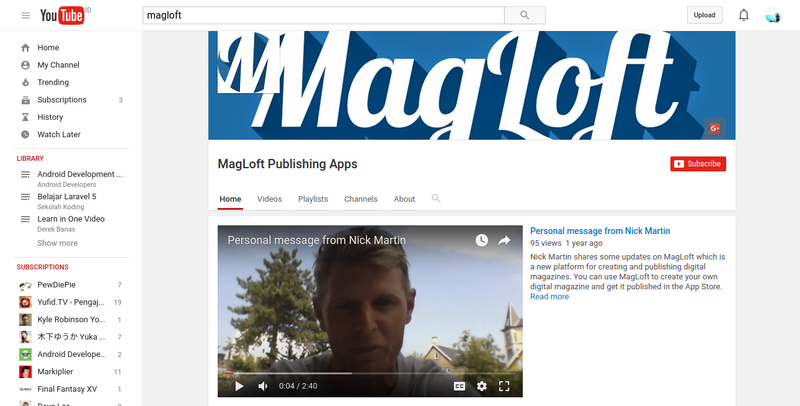 You can always test and review your content for free on any of your own devices by using the MagLoft Preview App found on both Apple App Store and the Google Play Store. Simply search for "MagLoft" on either of these stores and download the app. The best way to really test your app would be to go through the Publishing section of your MagLoft account and make sure all sections are green (completed). You can use some placeholder data to begin with. Then we can go ahead and create an iOS build for you, which you can test via TestFlight. Using TestFlight will allow you to see your entire app with all your own branding and colors on any iOS device. We can also setup something similar in Google Play where you get to test and see your entire app. This does require that you upgrade to our paid plan, but we offer a no fuss, 100% full money back guaranteed for 30 days. I am adding a YouTube video. Will the video appear inline when published or will it just show the link? We highly suggest you used the widgets for videos. This will allow them to play inside your pages. You get to keep your readers where you want them, without sending them to YouTube directly. We all know what happens when you go to YouTube right? Instant distractions! You can also you direct links if you want to. These links will still open a modal window so your readers will stay in your app, but they will load the YouTube page in the modal window so there is still a good chance of distracting your readers. I have non-english content, can I still use your Editor? Yes! You can use any language you want as we support them all.